HomeLAN FestCurriculum Vitae / ResumeNow Playing! Fast paced Survivor Killing Action! In a world filled with peacable minded zombies, 4 humans are determined to sow fear, panic, and gore among the population of swaying, mumbling, undead. Do your part to stop this warm-blooded menace today! This title delivers exactly what it promised. Co-op zombie apocalypse action. Intensity, mayhem, VOIP combine with solid gameplay and excellent technical execution. As far as shooting things go, its pretty much standard. The atmospheric and elemental quality that the undead bring to the game is much more rewarding. Its really good and I don't really want this to turn into a full-blown review site, there's plenty of them out there and most of them also draw comics, so I'll just say it, get the demo, play the demo. Its good, you'll be sold if you like eating humans... er, shooting zombies. The game has weathered a couple weeks fairly well. Not seeing any kind of patch or tweak because of the holiday season has been a bit of an issue. Some in-game things do need to be taken care of to get gameplay back up to its release level. Also, an official SDK could come a bit sooner. I've started a custom campaign and the pipeline from start to end isn't as streamlined as it could be. As well, I'd love official support for all of the goodies that the game brings to the table. The card game limb of the Legend of the Five Rings franchise by Alderac Entertainment. 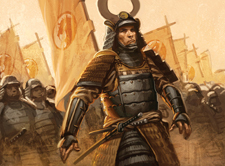 L5R is a world modeled after feudal Japan with several other Asian concepts blended in. This is the second time I've spent any significant time or money on this CCG. This time around I have a much higher appreciation for the rules handling and card content. For those not familiar with the game, it has a fairly high learning curve due to the various levels of interaction provided by the ruleset. Things I like: The game has several victory conditions that (depending on current card environment) are viable for competitive play. Military, Honor, Dishonor, Enlightenment, and Whatever Crazy Idea The Rules Team Decides To Come Up With Next. All in all the game is more balanced in this edition (Samurai) compared to the previous core set (Lotus). There's a ton of concept to look at this game and really it'd be easier, if you're interested, to just take a look at their site. The game has come a long, long way from the insanity that happened in Lotus. All in all, the game is still tremendously fun and has provided the opportunity to meet lots of interesting people. A couple of my friends got back into Magic: The Gathering but I'm feeling like I made a better choice with L5R. While the design is rooted in traditional MMO elements, there are several incremental updates to classic elements such as group questing and PvP. Care has been taken to reduce, though not eliminate, periodic grind. The cycle of quest, wash, repeat is present, but seem to take a "tutorial-esque" stance that is more about teaching the player how to use their character rather than attempting to grip the character with overarching plot and accomplishment. The Realm vs Realm (RvR) content is the obvious focus in the game with care taken to show that once players reach "Tier 4" they're supposed to be spending the majority of their time defending their areas from the opposing factions. Still having fun. Mythic made a solid product that still has some rough edges and flaws that need to be hammered out and polished but overall, it qualifies for my "15% better than the previous" rule. Mythic decided on accessibility over accomplishment for the first two Tiers. None of the content has been savage enough to cause mass deterence in any of the public quests I've experienced. I've progressed into the mid 20's but time constraints and other games have pulled me away from this one. Its not bad, it just doesn't seem to have the draw to keep me playing it over playing something else. I should really give it another go and see if I can make it into Tier 4. *giggle* Too much fun. When you're expecting a game to be a straight up skill challenge, the ego hit of dying numerous times isn't all that bad. I'm not trying to "get" anything other than running the Blue Bomber around the screen and blowing up Robot Masters. Spikes kill you. Pits kill you. Go. If you're looking for a classic skill-based (player, not character) game session, this will do you well. Managed to figure out the Robot Masters. Went back and played Mega Man 2 and confirmed a suspicion. MM9 Robot Masters have a very high tolerance to the Mega Buster compared to earlier titles in the franchise. I've gotten to the head of the flying submarine boss in Wily's Castle. Looking to put in the time to have it beaten by next week. Haven't finished off MM9 yet. Been taking some time to go back through the series starting from MM2. If I'm feeling really in the mood, maybe I'll go through the first one again. So far, gotten through 2, 3, and half of 4. Its interesting to see how things grow and change through the series.